Students of Kilinochchi Central College now have the privilege and opportunity of attaining Information Technology (IT) education in their school curriculum. 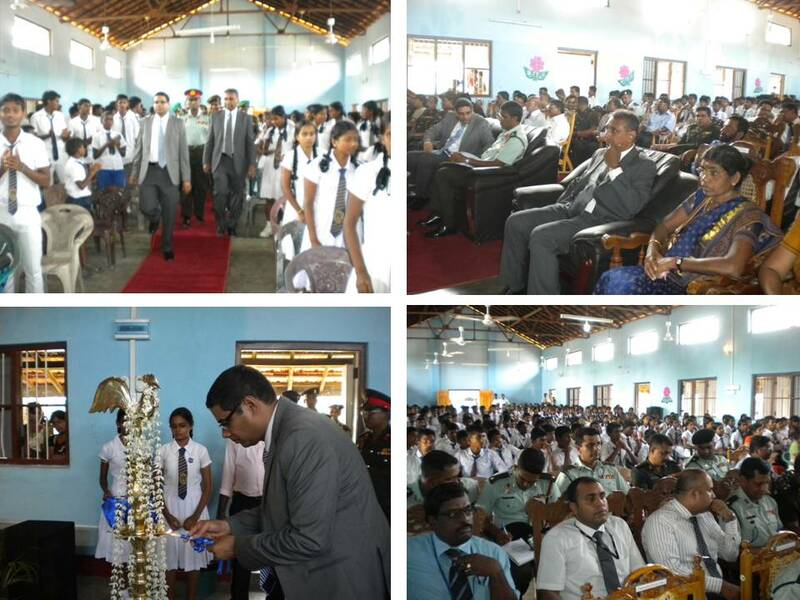 A fully equipped IT laboratory was developed and handed over to Kilinochchi Central College, today (22 November 2012) during a ceremony held at Kilinochchi. IT laboratory equipped with 8 Computers was donated by the Commercial Bank. Chairman, Commercial Bank Mr. Dinesh Weerakkody, Kilinochchi Security Forces Commander “”…” Major General Udaya Perera, Managing Director “”…” Commercial Bank Mr. Ravi Dias, Assistant General Managers of Commercial Bank, Regional Manager, Manager Commercial Bank Kilinochchi, other officials of Commercial Bank and Army Officers in the area were amongst the invitees to this great occasion. At the outset, all the invitees formally handed over the IT laboratory to the students of Kilinochchi Central College. Thereafter, a colourful ceremony was held to mark this event. Addressing the students and the teachers, Managing Director Commercial Bank stated that Commercial Bank mainly shares the social responsibilities in Education and Health sectors. IT laboratory donated to Kilinochchi Central College also fallen within the same purview and the Commercial Bank would continue to assist public in the future as well. Kilinochchi Commander in his speech mentioned that it he would take all possible endeavors to introduce IT education to all the schools comes under the area of Kilinochchi Command, similar to this attempt successfully completed with the great assistance from Commercial Bank. He took the opportunity to invite other members of the banking sector who had been invited to the occasion to share the social responsibilities in obtaining IT facilities to other schools too. Poor Sinhala schools don’t even have desks. These kids getting computers. Anyway they will NEVER vote for “Chingalam” political parties NO MATTER WHAT YOU GIVE THEM. Southern Expressway was built at a cost of 66 billion rupees. It has earned 1 billion rupees for one year. That means it takes more than 66 years to recover the cost!!! It won’t last for 66 years without major repairs. It seems that these were done to satisfy that VVIP LAMBOGINI driver. This WASTEFUL behavior of VVIPs is a CURSE. What about the children in the so called ‘ Border Vilagers”? We don’t see any of these perks nor any Vasanthayas for the those heroic people who defended Sri Lanka day and night when politicians were making deals with the LTTE so that they could live their lives in Colombo and in luxury. We need to see some improvements to the lives of these people and their children. As Lorenzo says we will never get any gratitude from the Eelamists for what we do. However it will be gratifying to see some justice, recognition and solace is given to those who kept faith in a Unitary Sri Lanka for years on end demanding only the essentials.